We are a lovely gallery and coffee shop in the beautiful Northumberland coastal village of Alnmouth just minuets from the beach. 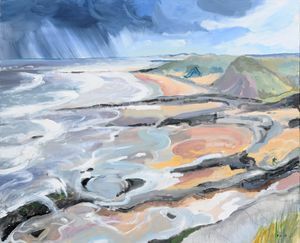 The Old School Gallery is home to the work of Northumberland artist Sue Fenlon. You can see all of her beautiful new paintings along with her stunning range of prints, cards and gifts. The gallery has a constant and ever changing range new work from other leading artists. Check the gallery page about our latest exhibitions.